This is that Quatrain of Nostradamus which describes CHYREN whom I had interpreted to mean Kalki Avatar, the tenth and final Avatar of Vishnu who is stated to manifest in this period which according to HINDU COSMOLOGY is Kaliyuga. 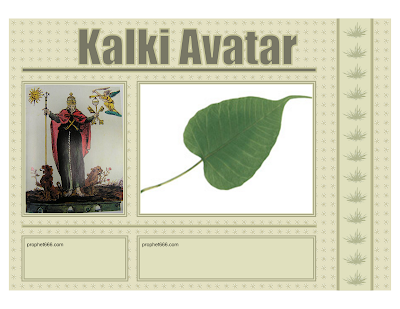 This is an interesting image from the Lost Book of Nostradamus which according to me is an image of Kalki Avatar. And he will he be more satisfied with the title of Victor. In this world who does not want to live the supreme life? Who does not want to receive the supreme achievement in life? I.e. everyone wants the supreme achievement. First of all we should know what is the supreme achievement? Whatever is the supreme in the entire creation, achieving that is the supreme achievement in life. What is the supreme? The supreme is none other than GOD, so achieving GOD is the supreme achievement in life. After this achievement there is no desire left in life. Achieving anything else except this is useless in this world. For how long will you have these fame, honour, wealth and riches? This world and anything related to this world is not yours, then why are you trying to make them yours? We should leave the discussion of other things even this body is not yours. You will also have to leave this body one day. Nothing of this world can stay with you for ever, then why are you running for it? If you have to run, then run behind that so you don’t need to run behind anything for your whole life. Try and achieve that which can not be separated from you afterwards. I.e. by any how, through any medium, whatever we have to do to get GOD and have a godly existence, we remain devoted to GOD, this is called the supreme position. What will happen when we meet GOD?